Extremwetter ist ein leidiger Begleiter im Leben des Menschen. Stürme, Überflutungen und Dürren machen uns seit Beginn der Zeiten zu schaffen. Neu ist lediglich, dass sich der Mensch nun selber als Auslöser des extremen Wetters sieht. Eine Selbstüberschätzung die gut in die modernen Zeiten passt, wo man problemlos zum Mond fliegen könnte, wenn man denn nur wollte. Ganz so neu ist die Idee der menschlichen Exrenwetterbeeinflussung dann aber doch nicht. Bereits im Mittelalter hatten man Schuldige identifiziert und auf den Marktplätzen als Hexen verbrannt. Keine gute Zeit. Und ob damals dadurch das Extremwetter reduziert werden konnte, ist leider nicht überliefert. Ergebnis: Das Extremwetter war offenbar in der ersten Hälfte des 20. Jahrhunderts häufiger als in der zweiten Hälfte, was so gar nicht zur anthropogenen Beeinflussung passen will. Das Ende des von Aktivisten extra neugeschaffenen Begriffes “Global Weirding“? Event attribution aims to estimate the role of an external driver after the occurrence of an extreme weather and climate event by comparing the probability that the event occurs in two counterfactual worlds. These probabilities are typically computed using ensembles of climate simulations whose simulated probabilities are known to be imperfect. The implications of using imperfect models in this context are largely unknown, limited by the number of observed extreme events in the past to conduct a robust evaluation. Using an idealized framework, this model limitation is studied by generating large number of simulations with variable reliability in simulated probability. The framework illustrates that unreliable climate simulations are prone to overestimate the attributable risk to climate change. Climate model ensembles tend to be overconfident in their representation of the climate variability which leads to systematic increase in the attributable risk to an extreme event. Our results suggest that event attribution approaches comprising of a single climate model would benefit from ensemble calibration in order to account for model inadequacies similarly as operational forecasting systems. Extreme weather and climate-related events occur in a particular place, by definition, infrequently. It is therefore challenging to detect systematic changes in their occurrence given the relative shortness of observational records. However, there is a clear interest from outside the climate science community in the extent to which recent damaging extreme events can be linked to human-induced climate change or natural climate variability. Event attribution studies seek to determine to what extent anthropogenic climate change has altered the probability or magnitude of particular events. They have shown clear evidence for human influence having increased the probability of many extremely warm seasonal temperatures and reduced the probability of extremely cold seasonal temperatures in many parts of the world. The evidence for human influence on the probability of extreme precipitation events, droughts, and storms is more mixed. Although the science of event attribution has developed rapidly in recent years, geographical coverage of events remains patchy and based on the interests and capabilities of individual research groups. The development of operational event attribution would allow a more timely and methodical production of attribution assessments than currently obtained on an ad hoc basis. For event attribution assessments to be most useful, remaining scientific uncertainties need to be robustly assessed and the results clearly communicated. This requires the continuing development of methodologies to assess the reliability of event attribution results and further work to understand the potential utility of event attribution for stakeholder groups and decision makers. A new data set of monthly temperatures, adjusted for detected inhomogeneities, was used to examine whether the monthly temperature climate of the U.S. has become more extreme. During the past two to three decades, there has been a shift toward more frequent very warm months, but less frequent very cold months. Thus, overall the monthly temperature climate has not become more extreme. Midtwentieth century including the 1930s was an earlier period of frequent very warm months, a result of very warm daytime temperatures, while nighttime temperatures were not unusual. Regionally, there is a lack of century-scale warming in the southeast U.S. annually and in parts of the central U.S. in the summer, characterized by lack of daytime warming while there has been nighttime warming. Compared to the earlier midcentury warm period, recent decades have been more (less) extreme in the summer (winter) in the west while Midwest summers have been less extreme. Die NOAA verwehrt sich übrigens gegen eine pauschale Verquickung jeglichen Extremwetters und dem menschengemachten Klimawandel. 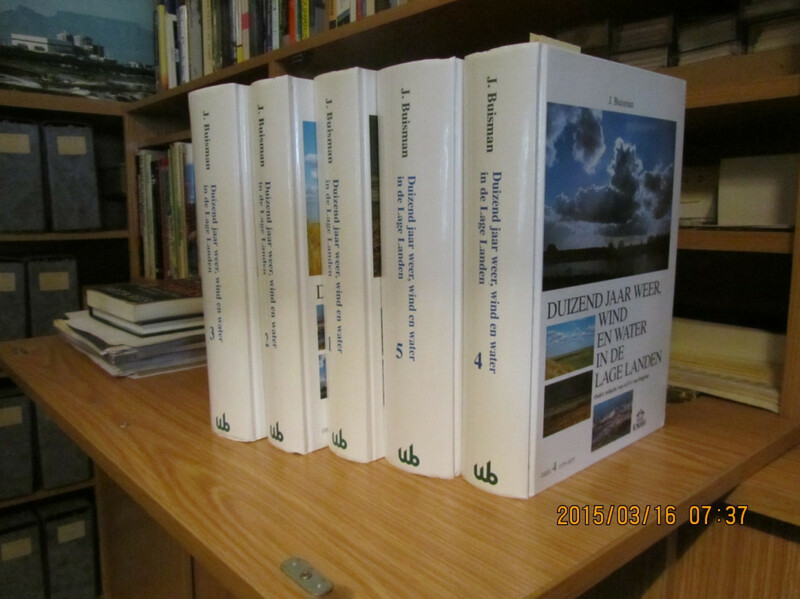 This is a 6-volume set in dutch, written by J Buisman. Each volume about 750-800 pages, with history of the weather , essentially Western Europe, from 763 to 1750, with between one and ten pages devoted to each year. Took thirty years to compile. Vol 7 is in preparation. Besides Western Europ, there are many notes on the rest of Europe, and even the US in places. With lots of quotations in (sometimes medieval) dutch, german, french, english from eye-witness reports and letters centuries ago, all with source references, maps, plates, facsimiles, etc. He just put in every weather related item he found, all mixed with the politics of the day: such as which admiral lost which batttle due to storm, which french army crossed which frozen river, the floods, storms, famines, malaria, etc. It is far more than weather history, it retells all political history and how weather influenced it. The misery of the Little Ice Age is spelt out in detail. A monumental piece of work. Issued with the assistance of KNMI (the dutch DWD). Das Werk ist hier zu bestellen. Die weltweiten Extremwetterschäden 2014 waren ungewöhnlich niedrig.